After the holidays are over, most of us have scraps of wrapping paper, bows and tissue strewn about. Sometimes, they have easy storage solutions: everything in a bin in the closet. Sometimes, it's not that easy - especially if you're tight on storage space to begin with. The key is to 1) keep all wrapping supplies together and 2) keep it in a place that is convenient to where you'd do the wrapping. First, let's talk wrapping paper: For flat wrap, there are a ton of options. Bins, baskets, drawers and even hanging file folders can hold flat wrap neatly. When it comes to tubes, or small scraps left from using most of a roll, you might have to be more creative on storage space. Use empty paper towel and toilet paper tubes to wrap paper in and around when the pieces are small. Secure with rubber bands. Storing long rolls can be a challenge. Some may not fit in your standard wrapping paper bin, even. Stand tubes upright in unused garbage cans or pails. If there just a few, a small space between a dresser and the wall could hide them sufficiently. I've even hung large, paper shopping bags on sturdy hangers to hold wrapping paper rolls in closets. If you've got more horizontal storage than vertical, hide rolls under a bed or couch. The fabric tote pictured from The Container Store might be a good solution for storage under furniture. Bags and Tissue: These are pretty common since they're so easy to use. The best is to store these items upright or flat. If it makes more sense for your space to store them upright, file the bags in a shopping bag, narrow rectangular trash can or bin. Depending on amount, tissue can go in front of the bags or in it's own container. If your space requires the items to be horizontal, try to keep them in the same container as the rolls of wrap. Otherwise, any short, wide container will work. 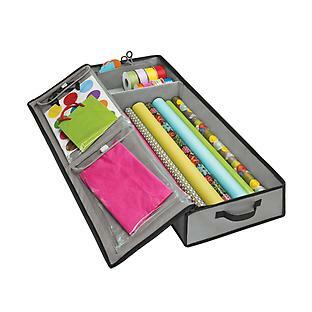 The Jokari Gift Wrap Organizer to the left has room to store bags, wrap and more, even. Bows and Ribbons: My favorite part of wrapping! Depending on how much you have, these items need some room. No one wants to top off a gift with a squished bow or scraggly ribbon. Roll ribbon around itself and secure with a paper clip. Store all ribbon in a box or small tub. To keep bows that are already constructed in shape, give them a container that has room. I like to reuse old popcorn tubs for this. They're sturdy and small enough to stow away. It's very similar to Recycle-Eh! 's way of storing bows and ribbon, as shown from her blog.